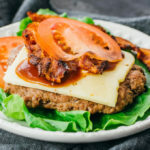 Instant Pot hamburgers served with lettuce, tomatoes, cheese, bacon, and BBQ sauce. Low carb, keto, and gluten free. Prepare 2 large pieces of aluminum foil and set aside. In a mixing bowl, combine all patty ingredients until well-mixed. Divide and shape into two thin 4-ounce patties, about 5 inches in diameter (they will shrink as they cook). Place one patty on each foil, and wrap them up. Add 1 1/2 cups of water to the pressure cooker pot. Place the trivet inside and stack the foil wrapped patties on top. Secure and seal the lid. Cook at high pressure for 8 minutes, followed by a manual pressure release. While it’s cooking, prepare your toppings. Carefully transfer the patties to a plate. Unwrap and drain the liquid. Serve with your favorite toppings.